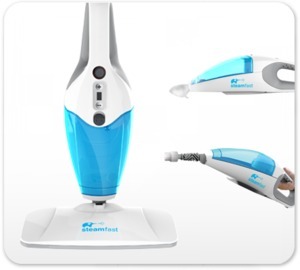 The Steamfast SF-295 3-in-1 Steam Mop effectively and naturally cleans and sanitizes a wide variety of hard floor surfaces. With user-controlled variable steam intensity, the 3-in-1 Steam Mop’s flow can be adjusted for use on most any hard floor imaginable – steam with confidence on everything from delicate hardwood to durable stained concrete. With a quick swap of attachments, the 3-in-1 Steam Mop becomes a fully functional handheld steam cleaner, for blasting tough dirt and grime from surfaces all around your home. Or, convert it into handheld fabric steamer for refreshing and releasing wrinkles from fabrics and upholstery. The 3-in-1 Steam Mop is truly an all-in-one steaming solution for every surface in your home. Item Weight - 3.93 lbs. Item Height - 47.5 in. Item Depth - 5.5 in. Item Width - 10.5 in.